Sometimes in the course of divorce or child custody proceedings, the court will award one party to pay certain fees, such as attorney’s fees, for the other party. If that party does not pay those fees, the recipient party can make a motion for a money judgment showing that the money was owed and was not paid. However, the court cannot collect the money for you; you have to go through certain steps to get the money from the person who owes you. Ask to be paid. 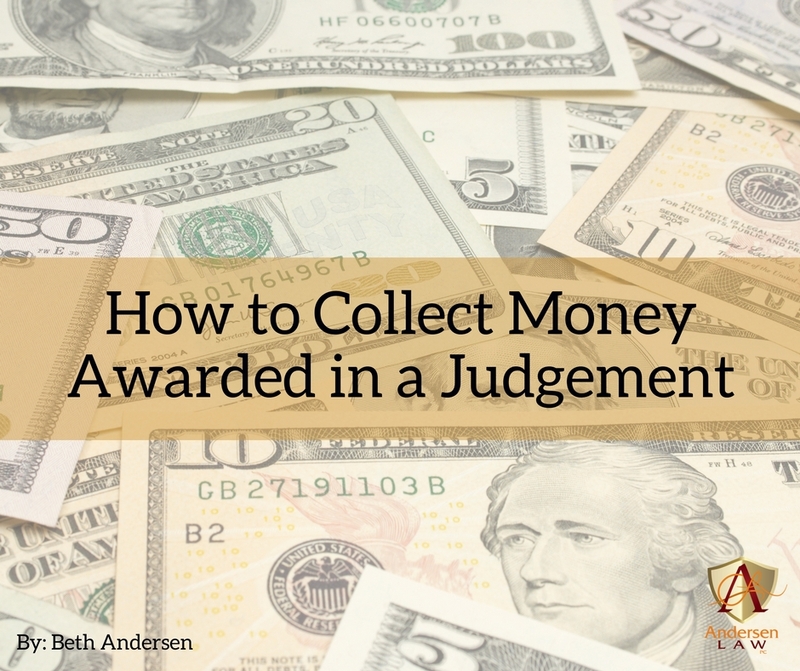 The first thing to do is to ask the person owing you money (the “judgment debtor”) to pay the amount awarded to you in the money judgment; this should be done in writing. 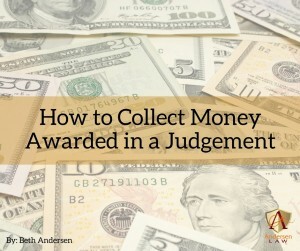 If the judgment debtor refuses to pay, you should move on to one or all of the steps below. Go to the clerk of the court where your judgment was entered and ask for a Transcript of Judgment. In Colorado, the fee is $25. Take the Transcript of Judgment and record it with the clerk and recorder of each county where the judgment debtor owns real property. In the general course of family law proceedings, each party will disclose what real property they own, so it should be simple to know where to record the transcript. Let the judgment debtor know that they will not be able to sell or mortgage/refinance the real estate until the judgment amount is paid in full and you release the judgment lien. When a court awards a money judgment in your favor, it is good for six years in county court, and for 20 years in district court. This means your judgment lien will eventually expire. However, you can file a Motion to Revive the judgment lien in court (before the expiration deadline) to continue your judgment lien. Form 26, Writ of Continuing Garnishment – This is the form you fill out, file with the court, and serve on the judgment debtor’s employer (“garnishee”). Form 27, Calculation of the Amount of Exempt Earnings – The garnishee will fill this form out. Form 28, Objection to the Calculation of the Amount of Exempt Earnings –The judgment debtor may use this form to object to the calculation of exempt earnings. Form 29, Writ of Garnishment with Notice of Exemption and Pending Levy – This is the form you fill out, file with the court, and serve on the judgment debtor and his/her bank (“garnishee”). The garnishee will fill out the rest of the writ and return it to you. Form 30, Claim of Exemption to Writ of Garnishment with Notice – This allows the garnishee/judgment creditor to list what amount of funds are exempt (can’t be collected). Form 89, Notice to Garnishee, Application of Funds to Judgment, and Release of Funds to Judgment Creditor – If the judgment debtor does not file a claim of exemption (Form 30) within 14 days, you fill out and file this form with the court and serve it on the garnishee. Fill out the requested information on the Writ and bring in the required paperwork (forms listed above) to the court. The clerk will issue the Writ once you pay the $45 fee. Checks should be made payable to the Clerk of Court if you are representing yourself; if you are represented by an attorney, checks can be made payable to yourself or your attorney. If you are representing yourself, the court requests that you provide self-addressed stamped envelopes so the court can forward the money received from a wage garnishment. For a wage garnishment, you must serve two copies of the Writ (Form 26) on the garnishee, along with a blank copy of Form 28. For a bank garnishment, you must serve one copy of the Writ on the garnishee, along with a blank copy of Form 30; you must also serve a copy of the Writ on the judgment debtor. The wage garnishment is good for 180 days. When it expires, you’ll have to complete a new Writ and serve it on the garnishee. Fill out a Satisfaction of Judgment form (JDF 111) and file it with the court. Mail a copy of the Satisfaction of Judgment form to the judgment debtor and garnishee, if any. If you recorded a lien on any real property, contact the Clerk and Recorder of the county where you recorded it and ask them to release the lien. As an attorney who often works with clients who choose to partially represent themselves, I am often regularly how the above process works. If you have questions about wage garnishment and receiving or paying awards, please contact Andersen Law PC at 720-922-3880 or email beth@andersenlawpc.com, and I’d be happy to help. Kameryn Brill contributed to this post. Edited by Magpie Media.